Dr. Rob Campbell and his two technicians, April Richards and Kevin Absil, installed the lower Copper River sonar station in mid-May, a project conducted by the Prince William Sound Science Center with support from the Copper River / Prince William Sound Marketing Association and the NOAA Saltonstall Kennedy grant program. The objective of this sonar site is to provide timely counts of upriver salmon passage to ADF&G managers, so they can better manage the fishery during the early portion of the Copper River run. 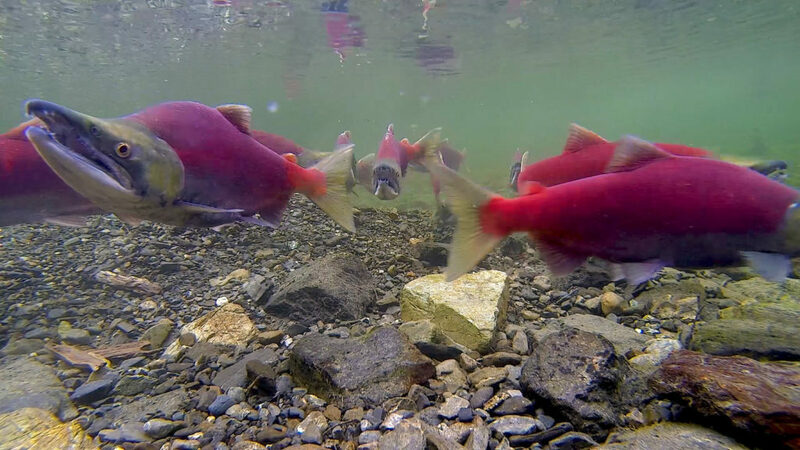 Copper River salmon are the first major salmon run to market each year and command a price premium during the first few fisheries openings. Gear piled up and ready to move out to the sonar site. The technicians will be at the site for an uninterrupted four-week stretch and must bring all their supplies down the river with them. 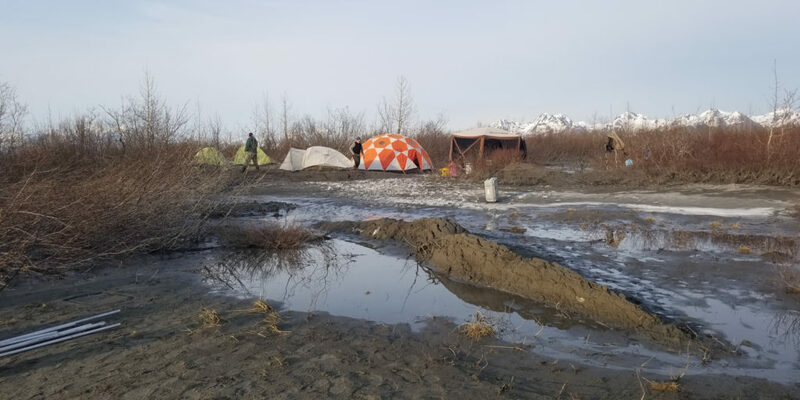 This year’s deployment took four trips through moderate to heavy ice conditions in the lower delta. 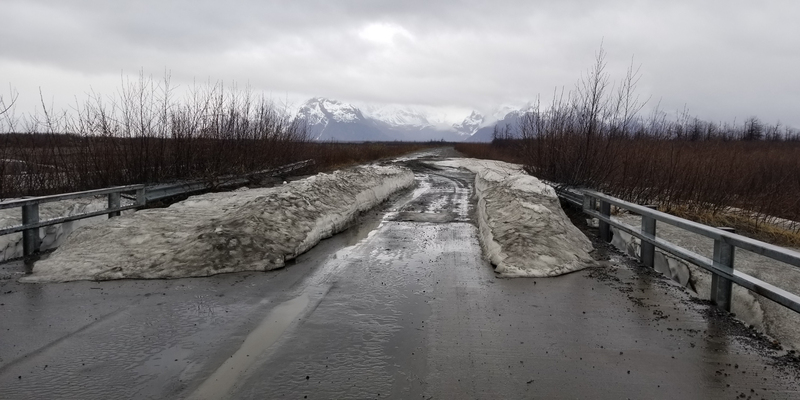 The Alaska DOT did not clear the Copper River highway this spring, so the team had to dig through this snowdrift at 34 mile to get to the launching point north of 36 mile. It took a day to dig a path about 50 feet long and up to 4 feet deep. 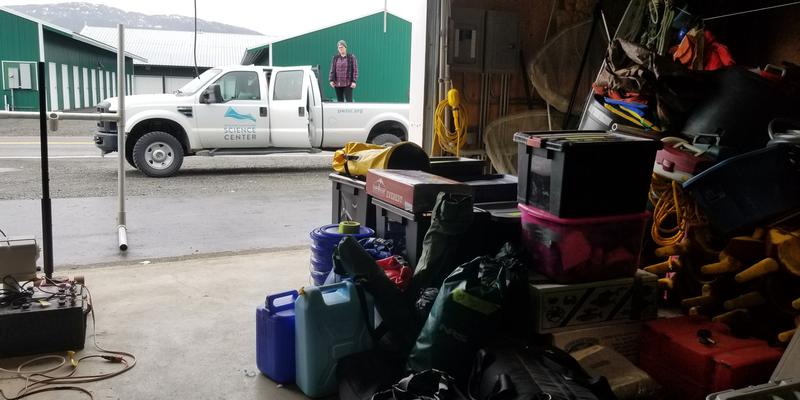 Technicians April and Kevin prepare to depart with the first load of gear from the launch site on May 12. 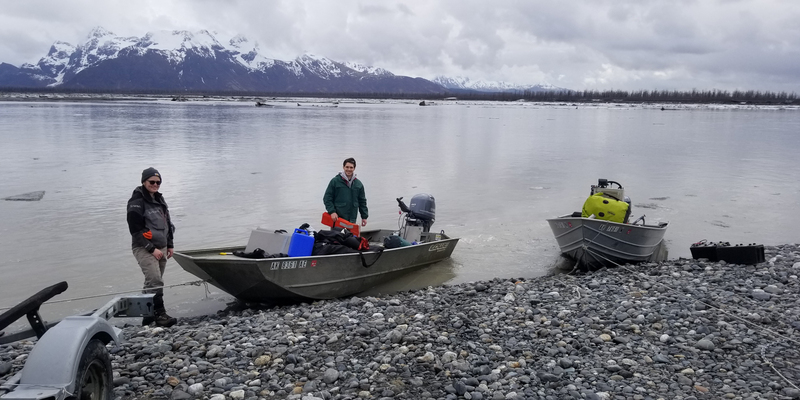 Setting up camp at the lower Copper River sonar station. The sonar on the east side of the river was set up first and allowed to record automatically while the camp was set up on the 12th. The technicians will be camped out at the sonar station until June 11, producing fish passage estimates that will be posted online. The east side sonar, which is located at the camp. The sonar is an imaging multibeam sonar with 512 individual beams (each beam is analogous to the depth sounder used on a boat). With that many beams, the sonar produces a video image where the fish may be observed swimming upriver past the sonar. 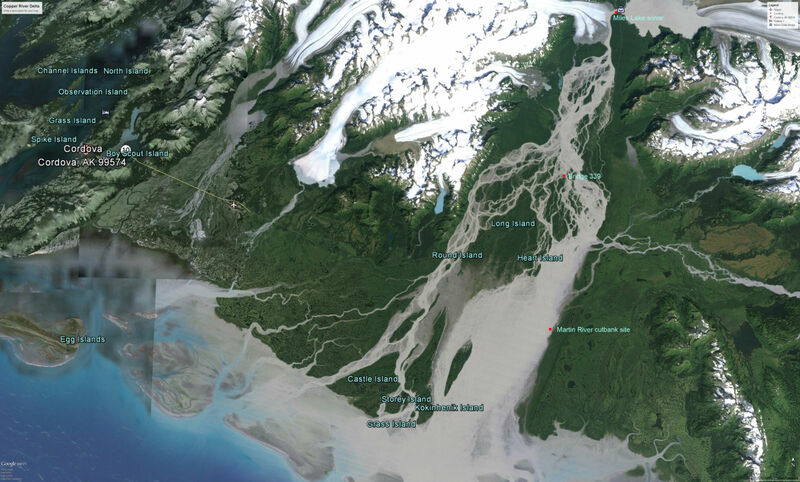 The sonar is run for 10 minutes out of every hour, and the number of upriver and downriver moving fish counted from the sonar videos. Those counts are used to produce an hourly estimate of fish passage. 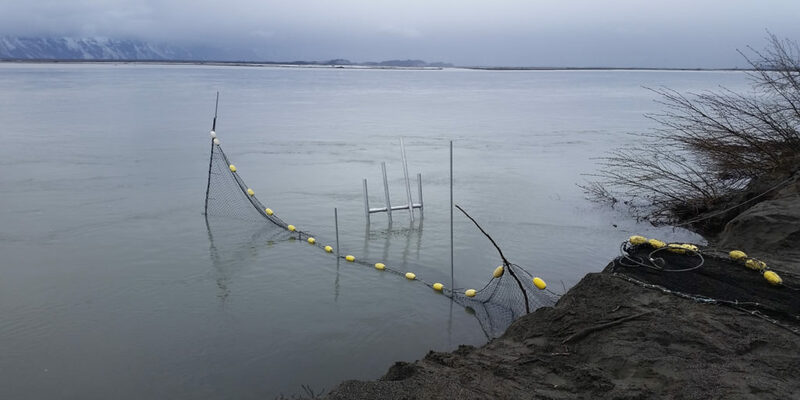 The net weir to the left was made by Mike Maxwell of LFS in Cordova and is used to move the fish away from the bank so that they may be better imaged by the sonar. The beam is very narrow close in and fish could swim underneath it otherwise. 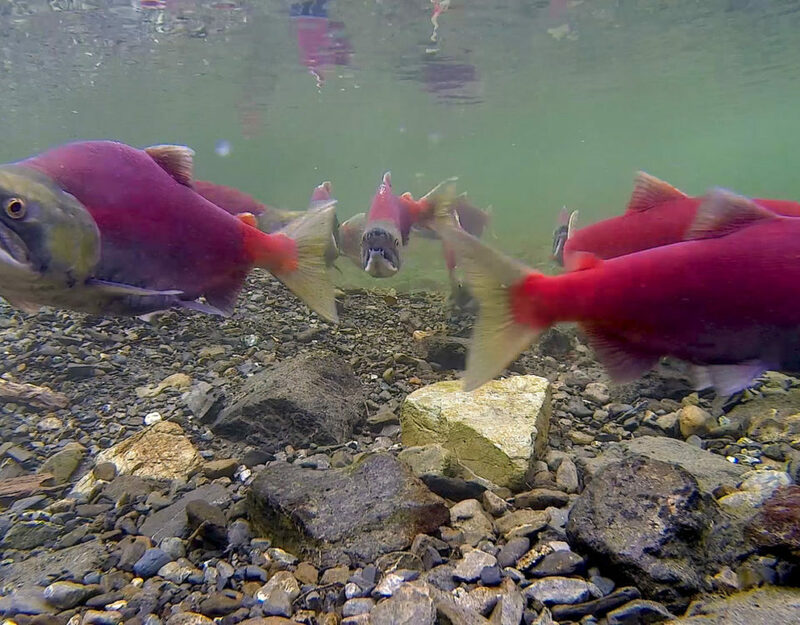 The sonar head is mounted on the aluminum frame and adjusted occasionally as the bottom profile changes—the Copper River moves a tremendous amount of material, up to 25,000 metric tons of suspended material per day, and the bottom is constantly changing. 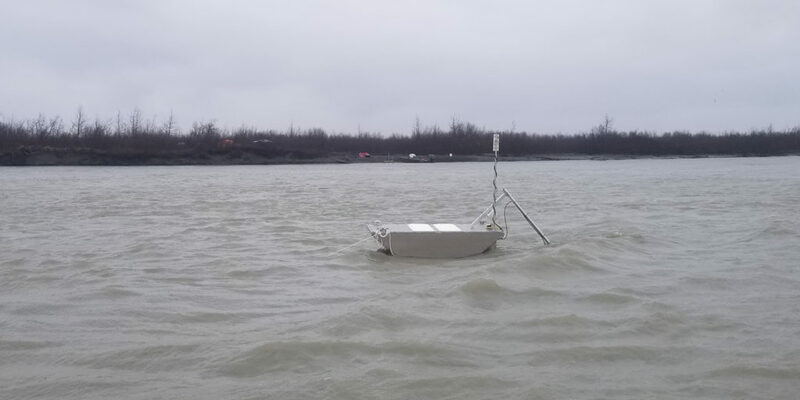 The west side sonar is mounted on a mini-barge designed by Dan Lofstrom of Steady Flux Inc. and fabricated locally by Ryan Webber of Northshore Welding. The barge was developed following lessoned learned during the 2017 deployment: The west bank changes considerably in the early season. Last year, the weir and sonar were almost buried when a new channel opened up. A high-pressure water jet was needed to rescue both, since the channels filled in faster than the technicians could dig. The depth profile on the western side is also quite shallow and does not appear to be attractive to up-migrating salmon, who are trying to avoid the dozens of seals trying to catch them. The mini barge allows the west side sonar to be positioned in deeper water where salmon are more likely to be encountered, yet inside of a bend to remain out of the way of floating debris. The sonar on the barge is downward-looking, which makes the best use of its 120° field of view. The sonar is mounted on a pan/tilt head that allows the technicians to adjust it remotely from the camp side. Control of the pan/tilt head and transmission of the sonar data is done by a wireless network link. Sonar counts are updated as soon as the information is available at: http://pwssc.org/2018-lower-copper-sonar/.